Corona Prayer Plant deserves its place among the showy plants of the Maranta (Marantaceae) family. Its broad, silvery-green leaves taper to a point and are edged with a wide band of dark green. 'Corona' is one of the most popular among the named varieties in the Calathea genus. Its handsome markings and colors make it easy to see why. New leaves are curled as they emerge, showing their purplish red undersides. And like its family members, this tropical foliage plant folds its leaves at night as hands in prayer. The secret to keeping it happy is to provide high humidity. Brown leaf tips indicate the air is too dry. Do anything you can to keep the relative humidity above 50%. Place it on a humidity tray or use a room humidifier. Calatheas also love to be misted with rainwater. Display Ideas: Group calatheas with other humidity-loving plants, such as bromeliads and ferns. 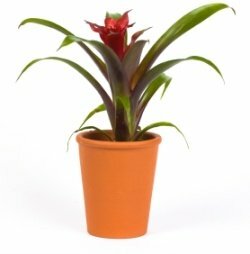 Or show off a single plant by placing it on a pedestal plant stand. 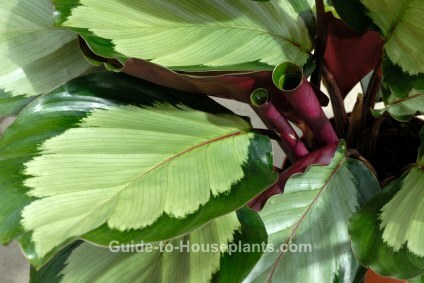 Repot calathea in spring to give it fresh potting mix. Need a new container? Check out stylish, new house plant pots here. Watch for spider mites. Dry indoor air in the winter months encourages these pests to invade house plants, another reason to keep the humidity up. You'll first notice faint webbing on the undersides of leaves. 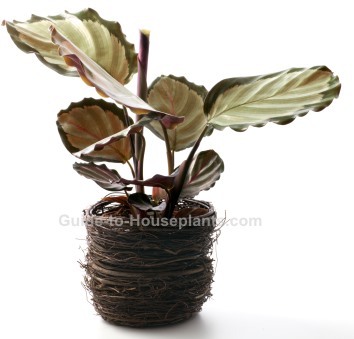 Don't use an oil-based insecticide on Calatheas because it will damage those beautiful leaves. And if your plant is badly infested, get rid of it. Light: Moderate to bright light. No direct sun. Water: Keep soil evenly moist. Do not allow the soil to get soggy. Use distilled water or rainwater because this plant is sensitive to fluoride and salts in tap water. Humidity: Moderate to high humidity. A room humdifier works best. Or set plant on a tray of wet pebbles. Mist its leaves with distilled water or rainwater (tap water with chlorine or fluoride can leave white spots on leaves) at room temperature. Soil: Peat moss based potting mix, such as African violet mix. Fertilizer: Feed every 2 weeks spring and summer with a 10-10-5 liquid fertilizer diluted by half. In fall and winter, feed monthly. Propagation: Division. Divide rhizomes of mature plants in spring or early summer. Discover echeveria species that make good succulent house plants. Get care tips for growing this easy plant indoors, how to propagate cuttings. 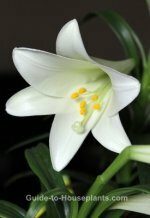 Easter lily care tips for growing lilies indoors. Find out how to coax blooms plus how to plant Lilium longiflorum bulbs outdoors. Discover fresh ways to add style to your home this spring. Love bromes? Scarlet Star, shown here, offers months of knockout color. Copyright © 2008-2019 Guide-to-Houseplants.com. All rights reserved. Unauthorized duplication or publication of any materials is prohibited.